Raise your hand if you hate wasting money on clothes. Scratch that, put your hand down, please. No offense, but your underarm stains are showing. Perhaps you can just do the raise-your-arm-from-your-elbow trick for the rest of your life to avoid showing those unsightly pits of yours. Don’t worry though, we have all been there and ruined some of our favorite clothing. Sadly, the pit-stained days extend beyond middle school. Have you ever walked around with your elbows high so your pits can dry, or even done a few elbow flaps hoping this will help? Have you carefully slid into your favorite outfit, and feel like you deserve an award for your performance, or you should at least be in a Mission Impossible laser beam scene. Then, when you straighten out your shirt, you notice the dreaded white chalky marks on your favorite shirt. How did that even happen? You know that part of your shirt didn’t even touch your pits. Are you just supposed to despair and leave your favorite clothes are ruined? Continue reading to find out how to get deodorant stains out of a shirt and how to remove underarm stains from dark clothing. You will be happy you learned this new information. It can be life-changing and money saving. Who doesn’t love that? You know you are a clean person, so why do you have stinky, yellow deodorant stains in the pits of your favorite shirt? The answer is simple, but also very annoying. The deodorant and antiperspirant you slathered on this morning, mixed with the sweat of the day is causing a chemical reaction between the aluminum-based compounds and your sweat. Great. The products you use to stay fresh and clean are also causing built up gunk in your shirts which encourages bacteria which causes odors and stains. What’s more is that even though you shower, your deodorant, and antiperspirant can still stick to your skin and become a pasty mess. Water mixed with your deodorant and antiperspirant can lead to even more issues when you go to put on your clothing. So if you’re now realizing something you have been doing wrong all of these years, don’t fret too much – you aren’t alone. If you’re wondering how to wash off antiperspirant, you need an exfoliant, like a baking soda and water mixture. Voila. 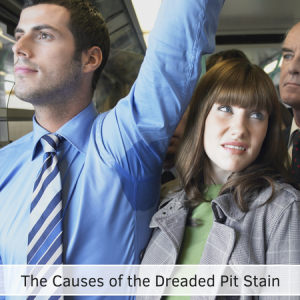 What is worse than a dreaded pit stain? Your co-worker at lunch informing you that you have white cakey deodorant marks all the way down your black shirt. Have you really been walking around all day like this? Awesome. Fresh marks are much easier to deal with than set in stains. Baby wipes, dryer sheets, and even cold water can get those marks right out. If you didn’t notice the mark when it was fresh it will be a little more difficult. The good news is that your shirt isn’t totally ruined. Read on to see how to get deodorant stains out of a shirt and better yet, how to remove deodorant build up from clothes. The good news is that your clothes aren’t ruined if you have deodorant stains. Are you the type of person that loves to scrub and let things soak? Or are you the person that doesn’t sort your laundry and hopes for the best when you toss it in the washer. Likely, you’re probably somewhere in between. 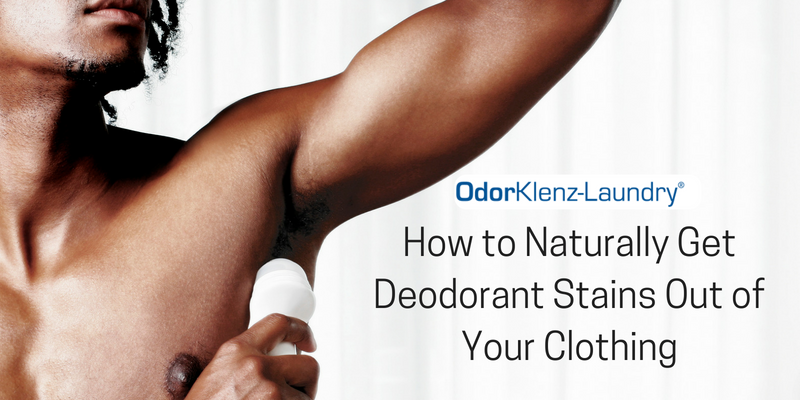 The best way to save time is to avoid getting deodorant build-up or stains in the first place. Is that easier said than done? Actually, no. It might mean breaking some habits, but it is quite simple. Apply to dry armpits – It might be normal for you to jump out of the shower and apply deodorant, but make sure those pits are nice and dry before you apply. Let your deodorant dry before you get dressed. One layer – don’t cake it on. Wear looser clothing – Let those pits feel a breeze. Of course, the above tips don’t always work as well as we want. If you have had enough of your stained shirts and products that are subpar, it is time to give something natural a try. Natural ingredients are better for you anyway, so that’s just an added bonus. 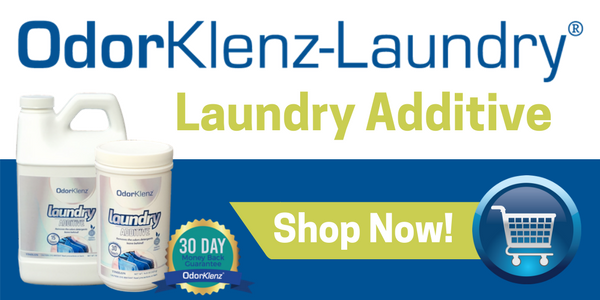 Instead of spending your time trying to get the stains out of your shirts, you could simply launder as usual using OdorKlenz products. Additionally, if you look at the above tips for getting out stains, you will notice some harsh chemicals. OdorKlenz products are gentle, natural, and free of harsh chemicals. 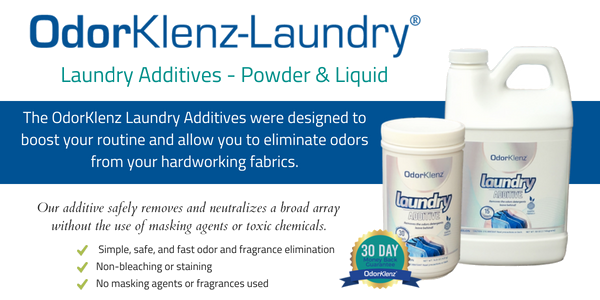 OdorKlenz liquid laundry additive is a top seller because of its natural ingredients while still maintaining its stain and odor fighting ability. Natural products that actually work are becoming more important in our daily lives. You want natural products that are a good quality for a reasonable price. OdorKlenz has developed a way for your clothes to come out of the laundry fresh, clean, and odor and stain free. Disrupting your daily routine with new products seems strange, but ask yourself, are you actually happy with the products you are using? Do they make you feel fresh and clean? Do they leave your clothes looking nice? You want products that make you look good, feel good, and smell good. The products that are part of our daily routine can literally make or break your day. If you are ready to make a change to natural products that are better for you and work harder for you, break your habits and give OdorKlenz laundry products a try. Your odor free, stain-free shirts will thank you. ✓ Provides Complete Odor Elimination. Say Goodbye to Foul Odors in Your Clothes for Good!